Simutowe to Compete in World Juniors! 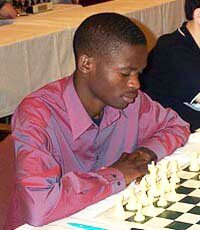 Reuben Phiri, "Simutowe to Represent Zambia At World Junior Chess Championship ," The Post, 16 November 2002, (Lusaka, Zambia). CHESS ace Amon Simutowe will be the only player to represent Zambia at the World Junior Chess Championship in Goa, Panaji, next month, Chess Federation of Zambia (CFZ) president Lewis N'cube said yesterday. Speaking when he returned from Bled, Slovenia where he led a team to the World Chess Olympiads, N'cube said this was the last tournament Simutowe would be playing for Zambia before he was admitted full time to University in the United States, "We feel in Simutowe we will adequately be represented at the tournament." This will be his last game, thereafter he will be playing for his university and we will only request for him during big tournaments like the Olympiads if he can be released," N'cube said. N'cube said the World Junior Chess championship coincides with the Africa Junior championship which takes place in Abuja, Nigeria. He announced that four players namely David Phiri, Daniel Jere, Chitumbo Mwali and Banji Chilala have been selected to compete in the Abuja tournament. "I am sure one of these will be able to bring the Africa Junior Championship," he said. And commenting on the just ended World Chess Olympiads, N'cube said finishing second in Africa was quite an achievement for the Zambian team. He cited Tunisia, Morocco, Algeria and South Africa among others, that Zambia beat as countries with vast resources but that Zambia's performance was boosted after assistance from the government. "The only sad part was losing to Botswana because we had underrated them," he said. The World Junior Chess championship is scheduled to take place alongside the Girls Under-20 championship in Goa, Panaji from December 8-21. IM Amon Simutowe (foreground) playing board #1 against Faroe Islands at the Chess Olympiad (Bled, Slovenia).